Were You Denied Insurance For Tornado Damage? If your insurance provider is not honoring your contract, a bad faith claim may be the next step you need to take. Contact an insurance denial lawyer at Carr & Carr Attorneys to learn what options you have. 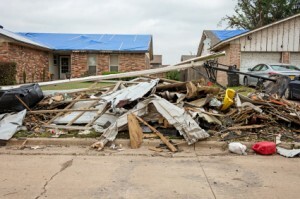 Homeowners whose houses were destroyed by the recent tornadoes in the Oklahoma City area may be having problems with their insurance providers, especially if the insurance carrier is Allstate. According to a story in Crain’s Chicago Business, under a program launched in October 2011, Allstate will pay only the actual cash value of a roof that needs to be replaced if the roof is more than 10 years old. Basically, if a homeowner with Allstate insurance needs a new roof — which very likely includes the majority of the homes recently damaged — they will have to cover the cost above the depreciated value of the roof under the House & Home program. Because this policy is different from how roof damage was previously handled, a homeowner may find themselves literally without a roof over their head. It is possible that homeowners with this problem may have a bad faith issue with their insurance company. Insurance bad faith refers to the failure of an insurance company to provide coverage for a legitimate claim filed by one of its insured policy holders. Bad faith can take many forms and can occur at any stage of the claim review and payment process. Insured people can sue an insurance company that acts in bad faith. If you are having problems that you feel are because your insurance company is not honoring its contract with you, then you should talk with a law firm which has experience with bad faith and insurance denial. The insurance bad faith lawyers at Carr & Carr Attorneys can help you determine your next steps. When a catastrophe happens, you need someone on your side if you have to battle an insurance company. Call 1-877-392-4878 to talk with a law firm representative now, or email us using this form and we will get back with you promptly.